CealDoctor™ is a revolutionary nanotechnology. Developed for all industry sectors -- such as automotive, marine, agricultural, military, rail and industrial equipment -- it provides numerous self-healing benefits for reciprocating fossil fuelled engines. Cealtec Products Inc. uses an advanced, patented process, that manufactures nano-metal powders. These metal particles, after being blended with motor oil, are injected into an engine crankcase. There the motor oil is used as the carrier to deliver and heal damaged cylinder walls and rings, as well as repair worn areas (like hairline cracks, micro-pores and grooves). This proves vital for engine stability, restoring cylinder compression and balance and aligning cylinders to within 5% of each other. This has an immediate and permanent effect, helping to reduce fuel consumption and Green House Gas (GHG) Emissions by up to 15% and smoke output by up to 40%. A recent study has demonstrated that stacking the CealDoctor™ Treatment with an external fuel treatment can drastically lower fuel consumption levels by 12.2% to 14.6%. This, combined lower maintenance costs and GHG protection, ensures optimum performance. 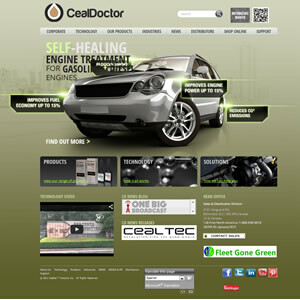 CealDoctor™ is a proactive approach to maintenance, effortlessly extending the life cycle of an engine. The technology field is ever-changing -- and One Big Broadcast is keeping pace, prov iding intuitive ways for businesses to promote their services and gain recognition. A perfect combination. Boasting revolutionary self-healing treatments for engines, CealDoctor™ will soon dominate the engine market. This privately owned company (located in Richmond, British Columbia) offers advanced nanotechnology. Its unique products -- including CealDoctor™ and the Cunix™ Motor Oils -- achieve optimum performance for gas and diesel engines. This is essential within the demanding industry sectors that use engines to power various types of power plants. One Big Broadcast now helps CealDoctor™ conquer those fields with ease. We have provided comprehensive branding and site design, showcasing CealDoctor™’s dynamic products. Our platform, with its one-click social tools and effortless integration methods, enables the company to create a strong virtual presence. Our use of automated content inspires high search engine rankings, while applications like private IMGY galleries and videos generate traffic. Every service is highlighted through SEO-friendly marketing. One Big Broadcast has also utilized ecommerce tools on the CealDoctor™ site, providing convenient (and quick) distribution options for customers. Our use of Microsoft's translation technology proves vital as well, introducing the company to a worldwide audience, broadening potential sales and attracting global distribution. These methods ensure total integration, allowing CealDoctor™ to better define itself online and within all industry sectors.